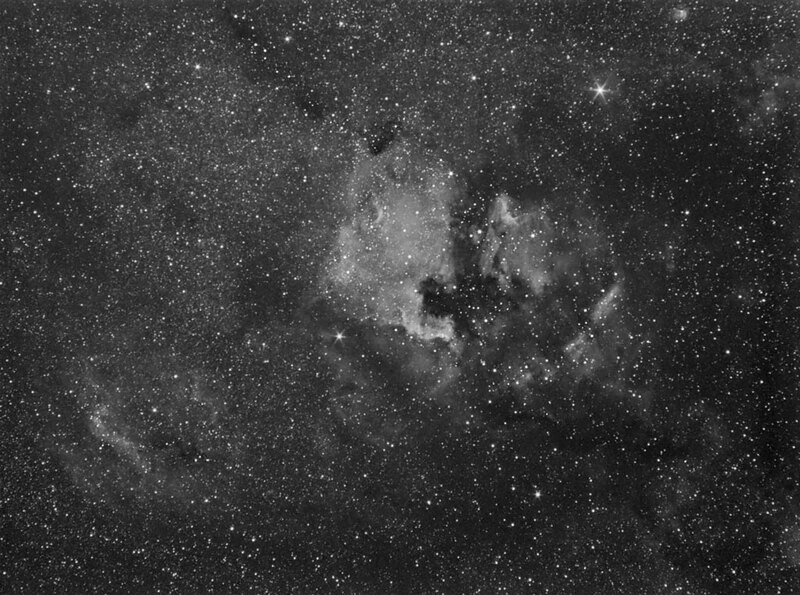 Adrian Brown took this wide field image of the North America Nebula (Caldwell 20/NGC 7000) and the Pelican Nebula (IC 5067-70) on the 23rd July 2006. The Pelican Nebula lies to the right (just west of) the North America Nebula as seen in this picture. Six 15 minute exposures were captured through a 13nm Astronomik Hydrogen Alpha filter via an ATK16HR CCD camera and a Pentax 50mm SLR camera lens at f/4. A Celestron CGE mount was used throughout, auto-guided via the program GuideDog and a Skywatcher 80T refractor and ATK-2HS CCD camera. Image acquisition and stacking was done in Maxim DL 4.53. Post processing was performed in Adobe Photoshop and consisted of Levels and Curves, a high pass filter to sharpen the image and selective use of the Gaussian Blur filter to smooth the background noise. 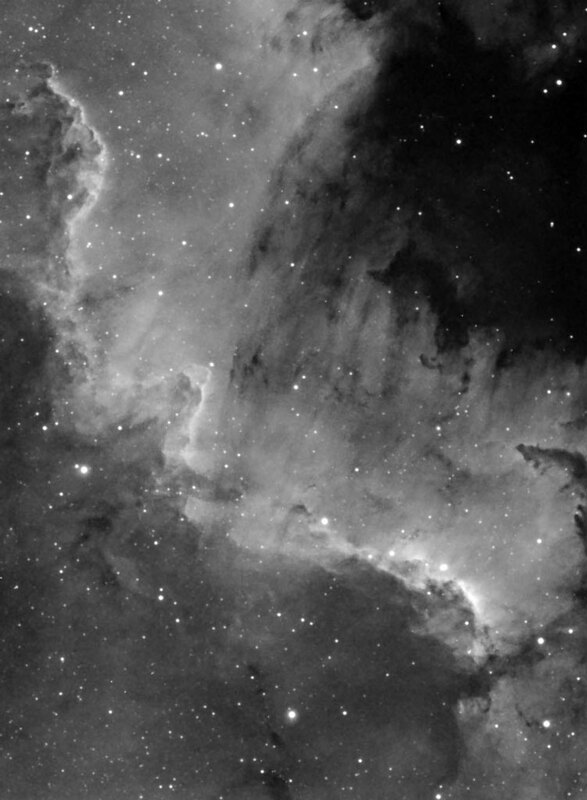 Here is a close up image of the North America Nebula (Caldwell 20/NGC 7000) and the Pelican Nebula (IC 5067-70) taken by Adrian Brown on the 23rd July 2006. The Pelican Nebula lies to the right (just west of) the North America Nebula as seen in this picture. Eight 5 minute exposures were captured through a 13nm Astronomik Hydrogen Alpha filter via an ATK16HR CCD camera and a Vivitar 135mm SLR camera lens at f/4. A Celestron CGE mount was used throughout, auto-guided via the program GuideDog and a Skywatcher 80T refractor and ATK-2HS CCD camera. Image acquisition and stacking was done in Maxim DL 4.53. Post processing was performed in Adobe Photoshop and consisted of Levels and Curves, a high pass filter to sharpen the image and selective use of the Gaussian Blur filter to smooth the background noise. Here is a close up image of the 'wall' or 'gulf' region [Panama? - webmaster] of the North America Nebula (Caldwell 20/NGC 7000) taken by Adrian Brown on the 10th June 2006. 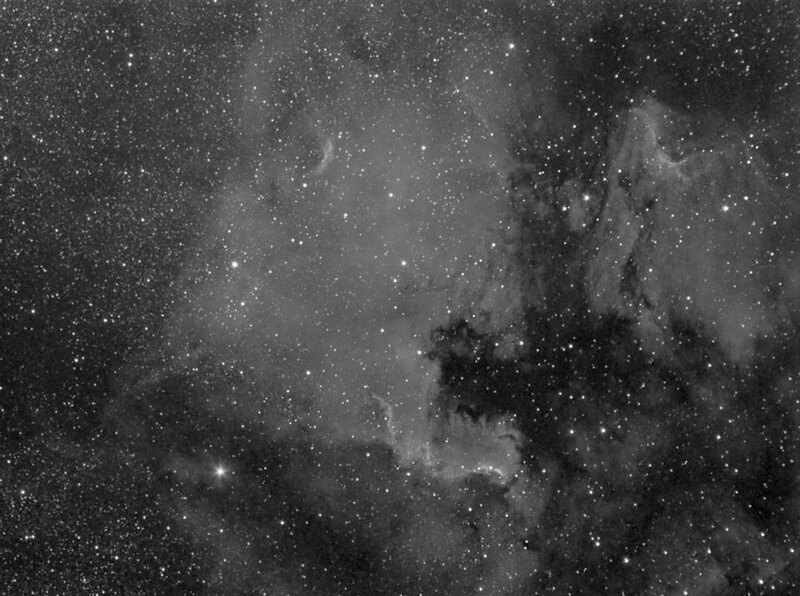 Ten 20 minute exposures were captured through a 6nm Astronomik Hydrogen Alpha filter via an ATK16HR CCD camera and a Sky-watcher 80ED refractor at f/7.5. A Celestron CGE mount was used throughout, auto-guided via the program GuideDog and a Skywatcher 80T refractor and ATK-2HS CCD camera. Image acquisition and stacking was done in Maxim DL 4.53. Post processing was performed in Adobe Photoshop and consisted of Levels	and Curves, a high pass filter to sharpen the image and selective use of the Gaussian Blur filter to smooth the background noise. The faint ghostly presence of the North America Nebula can just be made out against the rich milky way star field of Cygnus in this image by Chris Newsome. Chris took the image on the 19th November 2005 using a Canon EOS300D camera piggybacked on a Celestron C6-N with a CG-4 mount. The image comprises eight 210 second exposures. The camera was set and 200 mm and a skyglow filter was used. Stacking was done in K3CCDTools and (heavy) processing was done in CS2. Chris Newsome took this image of The North America Nebula and surroundings in Cygnus on the 17th November 2005. He used a Canon EOS300D camera with a 55mm lens and light pollution filter. 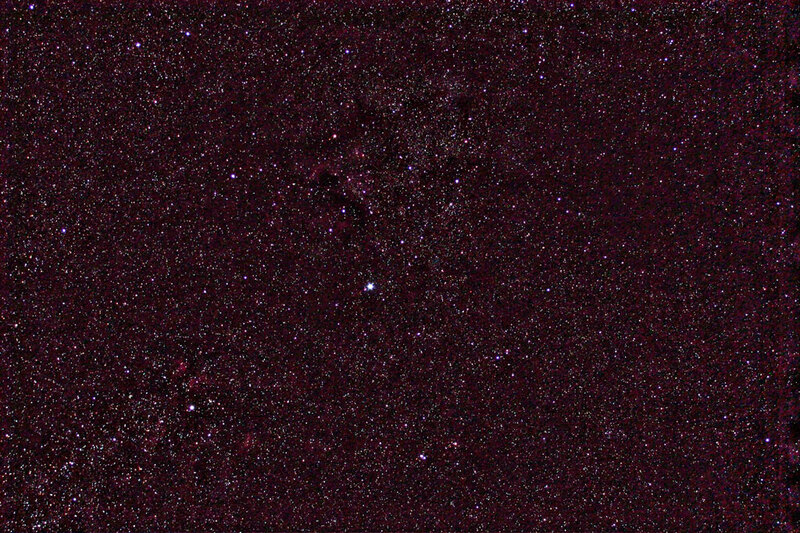 The camera was piggybacked on a Celestron C6-N with a CG-4 mount. The image comprises eight 5 minute exposures at 1600ASA, which were stacked and dark subtracted in K3CCDTools and then processed in Photoshop v7 (GradientXTerminator, curves and RGB levels). The bright star at the centre of the image is Deneb and the North America Nebula (so named because of its shape) lies above it - on its side with 'Central America' at left! Just below the North America Nebula (in the 11 o'clock position from Deneb) lies the fainter Pelican Nebula (IC 5067-70). 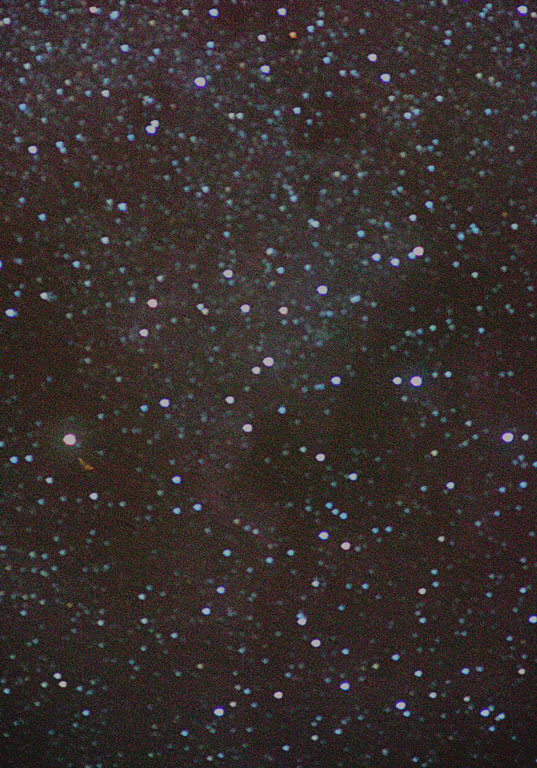 In the 7 o'clock position from Deneb in the lower-left portion of the image is the star Sadr (Gamma Cygni). This is surrounded by a complex of emission nebulosity designated IC 1318.